Costs at Michigan’s state universities have increased substantially over the past 10 years, so much so that returning tuition rates to what they were a decade ago would cost $2.8 billion, according to two analysts at the Mackinac Center for Public Policy. 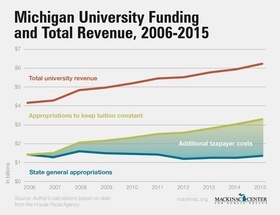 James Hohman, Mackinac Center assistant director of fiscal policy, and Policy Analyst Jarrett Skorup explain in a recent op-ed in Bridge magazine that rising costs at universities, not a lack of state aid, are the primary drivers of rising costs. Ten years ago, public universities in Michigan received $1.7 billion in state funds, adjusted for inflation, and average tuition was $6,890. Despite the fact that taxpayers are still spending $1.3 billion a year on universities, the average undergraduate tuition is $11,866, according to Hohman and Skorup. So what is driving tuition hikes? A likely main factor contributing to this phenomenon is the tendency of students to largely ignore costs when choosing a university. There is no incentive for universities to cut costs as long as students are willing to pay higher tuition – and so far, there has been little slowdown in the number of students wanting to attend college, despite it being more expensive than ever. Hohman and Skorup note there is no correlation between the amount of government spending on public universities and how many graduates and degree holders live in a state. Because of this, they argue, Michigan lawmakers should shift the money towards improving infrastructure, reducing debt or cutting taxes. Read the full op-ed at Bridge.